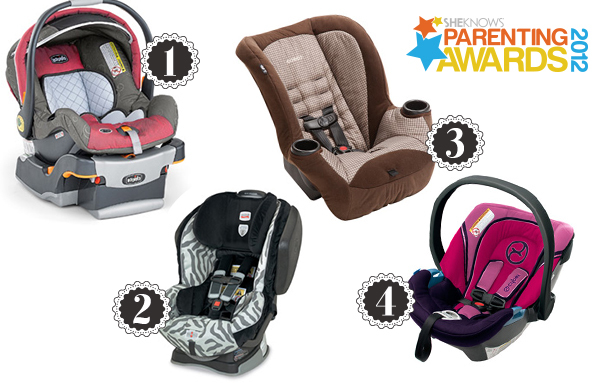 For the month of October, we’re sharing the finalists in 12 categories of our 2012 SheKnows Parenting Awards. Get the scoop on four car seats that ensure safe and comfortable travel. And don’t forget to vote for your favorite before October 31. The key to keeping your baby safer on the road is proper installation, and the Chicco KeyFit is easy to install correctly. Securing babies from 4 to 30 pounds, the energy-absorbing foam improves side-impact protection and the thickly cushioned seat pad and five-point harness provide maximum comfort. There’s a removable newborn insert for smaller babies. The KeyFit has a spring-assisted level foot, bubble levels and center-pull adjustment for easy installation. The Britax Advocate 70-G3 provides 360 degrees of protection. Its visible revolutionary car seat safety technologies and convenience features make it a must-have for parents. The chest pads compress to manage energy and create resistance to the child’s forward movement in a crash. Special technology to reduce the affects of side impacts and an energy-absorbing tether divert crash forces away from the child, while integrated steel bars strengthen the seat’s connection to the car. A brand known for solid value and smart design, Cosco introduces the new Apt 40RF Convertible Car Seat. The Cosco Apt 40RF allows children to ride rear-facing up to 40 pounds. Features include side impact-protection, five harness heights, five-point harness with up-front adjuster, three buckle locations and two integrated cup holders. Aton provides effortless installation with minimal physical strength, making it an easy-to-install seat for babies 4 to 32 pounds (up to 30 inches tall). Unlike many others, it secures easily with the car’s lap or shoulder strap with the patented belt tensioner. The release mechanism for the carrier portion is on the base, rather than built into the carrier, which reduces the weight you carry around to a low 8.8 pounds. It also works as a travel system with all of CYBEX and many other strollers.